JULY 17TH 2015:// CLOSED Read More? 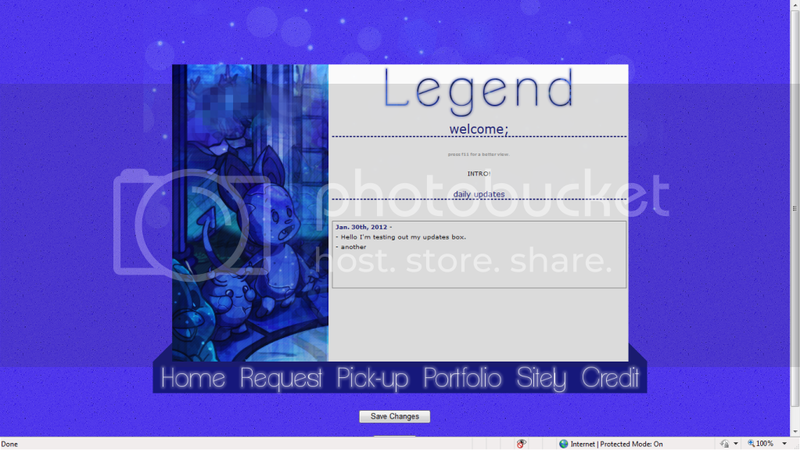 Welcome cmpiscool85 to Legend, a layout, button and banner requesting site opened on January 31st. 2012. I'm Michael, the owner of this site. Here at Legend I strive to make graphics to the best of my ability. I hope I can help you find what your looking for. If you have any questions please, neomail me! So, have a look around and request a graphic. if you'd like. 001) - Visible credit to /~exxula is a must. 002) - I only make graphics for on-neo sites. 003) - I do not make buttons for about me pages and other button sites. 004) - I only make Neo-related graphics. 005) - If the image you provided me will not be a good fit or your graphic I'll ask you to pick another. 006) - If you request a button, I will pick the border, font, and animation. You get to pick the image. 007) - Please, don't be rude! Put cheese anywhere in your neomail. 008) - If you don't like what I made you tell me! I'll be happy to remake it for you. 009) - Please be as descriptive as possible in your form. This way your graphic can come out just perfect! You can pick an image from here or here, or I can pick for you. 01) - Esme @ Karma. 02) - no one @ no where. 03) - no one @ no where. 04) - no one @ no where. 01) - Maddie @ My portfolio. 02) - Brenda @ Serene. Requests take 3-6 days to complete, depending on your spot on the waiting list. Requests take 2-5 days to complete, depending on your spot on the waiting list. ~ All the layouts that we've used. ~ All the places Legend has been Featured, Ranked and everything else! Have an idea for an extra? Neomail it to me! One of my favorites. I really liked how this one turned out with the navigation. I'll always like this one, because it was Legend's first layout. This layout wasn't my favorite but it worked. The reason I didn't like it was it looked to much like my old layout. Want to be affiliates with Legend? Neomail me! Did I forget to credit you? Please, let me know! Backgound from 49 Days, re-colored by me. Textures and png on layouts, buttons and banners from Details. Brushes from The Stamps Co. The name Legend came from The Continent of Server. If you graphic is not here it's in my Portfolio. (insert graphic type here) by Legend. (insert graphic type here by Legend. - I'm so sorry for not updating! My internet has been out and is still not working very well. I've been working on requests but since my internet is to slow right now I can't make uploads. - My internet is getting better though. I should be active next week sometime. - I'm terribly sorry if you still waiting for your button/layout. I will get your button/layout out to you ASAP! - I closed layout and button requests. - Banner requests are still open! Why not request one? - Finished 2 layout requests. - Finished 1 button request. - Requests are still open! Why not request something? - Now affiliates with the awesome Scheme! - Requests are OPEN! Why not request something? - Now affiliates with Inspire, Autumn Breezes & Infinity! - All requests shouls be open later. - I finished a lot of requests last night. I'll upload them some time today tomorrow. - Layout & button requests closed. - Nothing else new.. Just working on requests. - Now listed at HOLT. - All requests are open! Why not request something? - New layout. Welcome to V.3 Fall Days. - +3 Link back buttons. - Sorry for the lack of updates AGAIN!! - If your waiting for a graphic from me, I'll have it done soon! 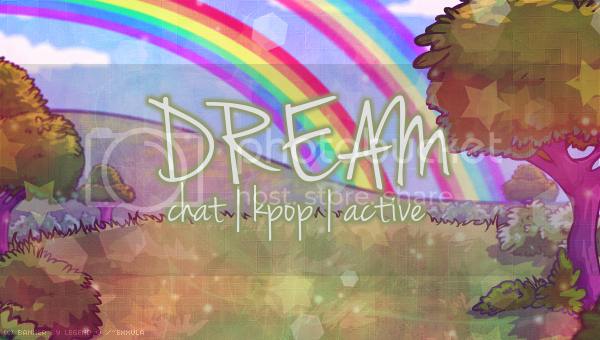 - Finished 1 banner and layout. - +2 banner and button request. - I'm going to try to get at least one layout done today. - I'll be gone tomorrow and Wednesday. I'll probably won't update until Thursday. - Hey everyone! Sorry for the lack in updates. - Now ranked 4th under requests at Short & Sweet! - Now ranked 4th under layout requests at Shenyi! - I SO SORRY! My cousin invited me to her house and I couldn't say no! Sorry to all requesters, I'll have your graphic done as soon as possible! - I worked on some stuff last night. Sorry for the long wait everyone! - Now ranked 3rd under layout requests at Zig Zag! - +1 canceled button request. - Now affiliates with Mediocre Salad! - I won't be on at all today. Maybe later. - Now affiliates with Opaque! - I entered the SOTM at Zig Zag! - Now affiliates with Zig Zag! - My spring break starts tomorrow so updates my be slow. - New layout is up (V.2 Lost Desert)! Feedback would be accepted. - Did anyone see the new Extras section? Go check it out! - All requests are OPEN!!! :D Why not go request something? - Now affiliates with Boxed Up Inside. - Now listed at Simple Gifts, The Secret Library, The Shelf Directory & Serendipity Directory! - All of these directories are awesome! I suggest you visit them. 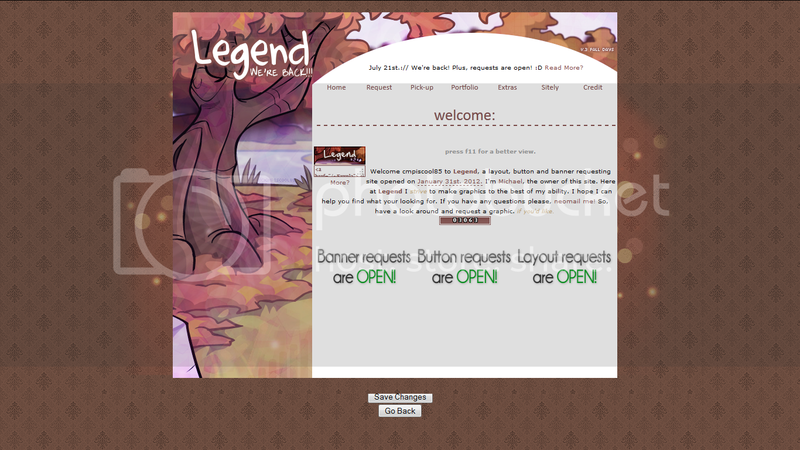 - I finished a TON of stuff on Legend's new layout today. It should be up tomorrow. - Anyways, I'll be working on a new layout. So, requests will be closed for a couple days. - I feel like I'm neglecting Legend. D; Every since Soroptimist closed I've lost motivation. Also, it's been so nice outside! I apologize to everyone for lack of open requests. - I'm finishing up Mimi's layout. - I don't have school tomorrow so I'll work on requests tonight and tomorrow. - Dude I really need to finish this last layout! :/ Sorry Mimi! - +1 banner request. :P I thought I closed those, but I guess I didn't. - Replaced two link backs. I really like them both. - Finished three button requests. - Sorry for the late update, I helped my dad with some yard work. - Ahh myy bad I can go on and on about stuff like that ^ But really. Who is going to take her place? 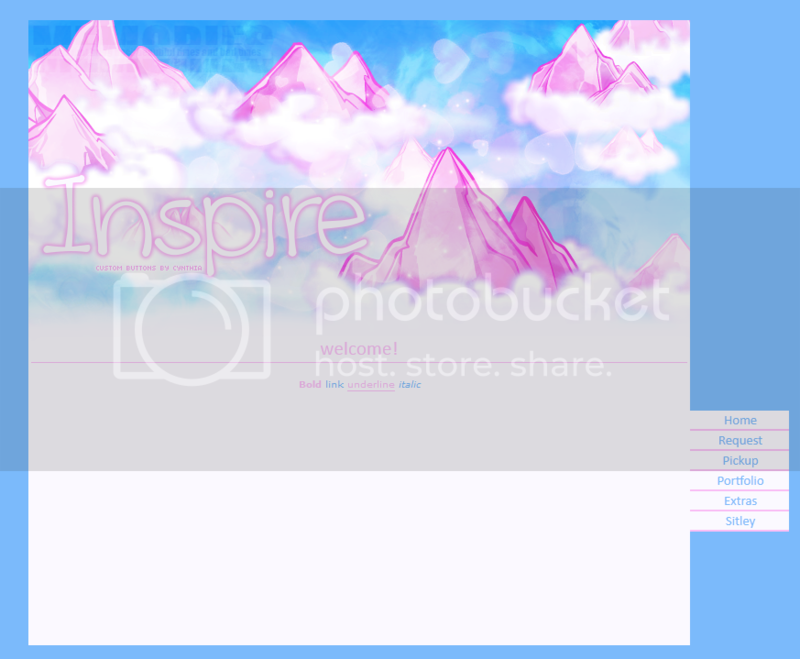 - Finished two layout request. - Finished two button requests. - Now affiliates with Queen of Hearts! - Got my review back from Voila! After reading my review I've decided to re-make everything I've made today. - Sorry if your still waiting for your graphic, I'm trying my best to go fast. - Now affiliates with Annex & Mesmeric! - Finished two banners, and one button. - Voting is still going on at The Escapist! PLEASE spare Legend a vote? - Layout requests are closed. 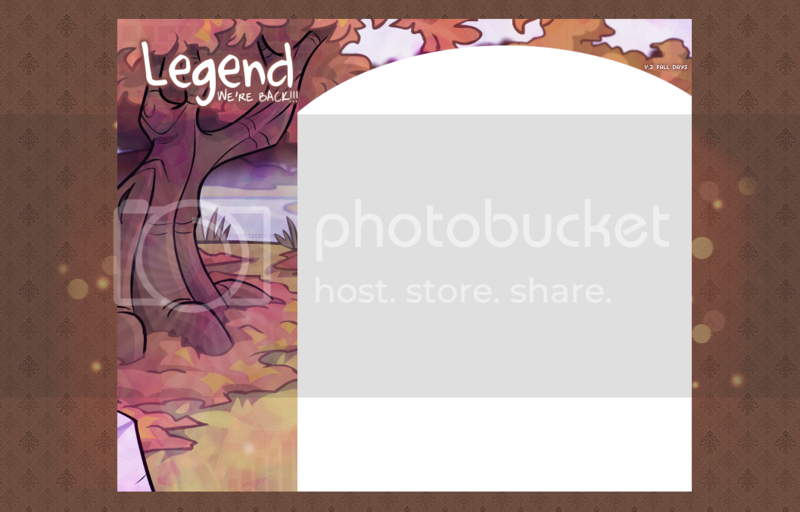 - Finished the last layout request! - Ok, it's Legend's offical one month anniversary! 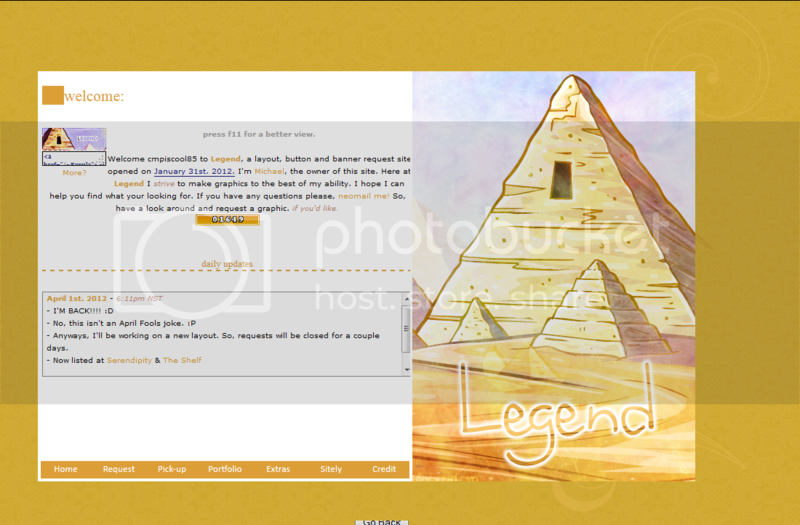 - Also, we hit +1000 page views :D I just want to say thank you to all the people who vist Legend everyday. It means SOOOO much to me. You have no idea. - Well after all the great news posted above, it's Friday! I'll work on requests later. - This day keeps getting better and better for me! :D Now ranked number 5th under layout requests at Illusion & listed as a Honourable Mention under button requests at Echelon! - Won't be on much today. - I'll work on requests tomorrow. - If you haven't seen the new neopets games room I suggest you check it out. - I'm not going to be able to work on anything tomorrow! :( I'll try to get a lot done today. - Replaced the second link back button. I never liked that one very well. - +1 button & layout request. - I feel a lot better today! I think I might wait until Friday to open requests. - Now listed at Excessively Directory. - I'm sick! :( I don't think I'll be on much today..
- I'm going to open requests Wednesday night. - I think I'll be able to open requests soon. - :O 700+ page views? Did I read that right? Thanks to everyone who has vistited Legend. It really means a lot. - Working on requests :) I think I'll be able to get them all done by Wednesday. - Wow, I finished almost everything! :D I'll upload tomorrow. - Now affiliates with Asylum! - I feel like I'm not working on requests! I'll get most of them done this weekend. I hope. Feb. 15th 2012 - 8:24pm NST. - Wow, Opulence closed! :( What a great site. It's a shame to see it go. - Finished one layout and two buttons. - Wow I got 5 layout requests! :O I accepted them all because it's a long weekend this week. - Wow. I finished all the waiting lists! - Finished the last layout request. - I'm planning on opening layout requests tomorrow. - Now affiliates with the newly opened Lucky! - One new link back. I think it looks awesome! Go check it out! - Woo hoo my internet is back! :D I'll get working on requests. - Wow I finished a lot of stuff. Now I just need to upload them. - My internet is pretty slow right now. I can't do anything! I'm hoping it will get faster soon. If it doesn't I'll spend some time at my grandmas house tomorrow so I can work on requests. - I'll work on requests after school. - Affiliate requests are open, so please apply! - +4 3 button requests. Finished one button. - Button and banner requests are still open! Why not request something? - All Button and Banner requests are open! Why not request something? - Now affiliates with One of a Kind & Flowerbomb! - Requests will be open sometime Monday I think. - One new link back button. I really like how it turned out. - Now affiliates with Bedazzled, J'accuse, Opulence & Illusion! - Received three button requests. - All requests are closed until I finish all the waiting lists. - Now Listed at Silver Directory. - Sorry updates have been slow. I'm really tired today (as I said). - I won't be able to get on until late tomorrow. - I will probably spending the day at my grandma's house. so we well see if I can work on requests. - Affiliates with The Escapist & Pulse! - I moved the counter from the Credit page to the home page. - Two Three requests done. Now I'm working on Abbie's layout. - Now listed at Plethora, Hippotastic, Smiley Central & Dragon's Lair. - Requests are open so why not request somthing? - Hoping to get some affiliates and listers soon. - +1 button, bannner request.